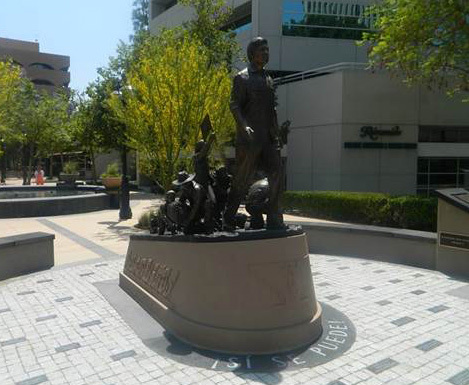 A monument to American farm worker, labor leader, civil rights activist, and human rights advocate Cesar Chavez is located on the pedestrian mall in historic downtown Riverside. The Chavez monument is placed on the mall near University Avenue, joining existing statues of civil rights activists Martin Luther King, Jr. and Mohandas Gandhi; Korean independence activist Ahn Chang-Ho; Medal of Honor recipient Ysmael Villegas; and most recently citrus pioneer and activist Eliza Tibbets. Cesar Estrada Chavez was born on March 31, 1927 in Yuma, Arizona, in family of six children. The Chavez family became migrant farm workers in 1937 after losing their own farm in the Great Depression. Cesar left school with an eighth grade education to join his family working full time in the fields. Cesar spent his youth and adulthood traveling across the southwest working in the fields and vineyards, where he was exposed first hand to the trials and injustices of migrant farm worker life. Cesar attended more than three dozen elementary and middle schools. Though his formal education ended early, he was an eternal student of life and was well read throughout his existence. The walls of his UFW office in La Paz were lined with hundreds of books ranging from philosophy and economics, to biographies on Gandhi and the Kennedys. He believed that, “The end of all education should surely be service to others," a conviction that he adhered to throughout his life. In 1939 the Chavez family settled in the San Jose area of California, living in a barrio called Sal Si Puedes (Get Out If You Can). In 1944, Cesar joined the United States Navy at the age of seventeen and served for two years in the Western Pacific during the reverberation of World War II. He returned from service to wed Helen Fabela, whom he had met working in the vineyards of central California. Cesar’s endeavor as a community advocate commenced in 1952, when he became an organizer for the Community Service Organization (CSO), a Latino civil rights group. Cesar organized voter registration drives, made speeches in support of workers’ rights, and conducted campaigns against racial and economic discrimination. In the late 1950s and early 1960s, Cesar served as the CSO’s national director. Cesar’s vision was to establish an organization to protect and serve farm workers, whose poverty and marginalization he had experienced. In 1962, Cesar resigned from the CSO, sacrificing the security of a consistent income to establish the National Farm Workers Association with Dolores Huerta. It was later called the United Farm Workers (UFW). For greater than three decades Cesar led the first successful farm worker’s union in American history. Against previously undefeatable odds, he led effective strikes and boycotts that paved the way for the first industry-wide labor contracts in American agriculture history. He was effective in attaining dignity, respect, fair compensation, and benefits, in addition to innumerable other rights and securities for numerous farm workers. His union’s efforts brought about the passage of the groundbreaking 1975 California Agricultural Labor Relations Act to protect farm workers. The succeeding influence of Cesar’s life surpasses any single cause or struggle. He was a humble man and a distinct leader. He was a prominent humanitarian and persistent advocate who empowered millions of Americans to seek empathy, fairness, and civil rights for the less fortunate in our society. The moral influence of his personality and his insistence of non-violence have had long lasting inspiration. A true American hero, Cesar died peacefully in his sleep on April 23, 1993 near Yuma, Arizona, close to the small family farm where he was born. The late Senator Robert Kennedy called him “one of the heroic figures of our time." Eighteen years after his passing many dedicated people work hard each day to carry on the vision of Cesar Chavez, members and supporters of Latino Network included.